We open on Mr Dalek, zooming across the floor to Adam's office. We do not hear any dialogue, but the tableau seems to have a very 60s musical feel to it. Like an orchestra was playing. Mr Dalek enters Adam's office, where Adam is about to drink whatever that substance is in his teacup. The music drowns out any dialogue, but Mr Dalek shouts at Adam, tosses down a piece of paper so violently that Adam's teacup shatters, and zooms out of the office. With the paper is Mr Dalek's badge showing him as a member of Adam's Army Of Evil. Adam stamps the badge "resigned". Mr Dalek's senses begin to come online. He is feeling groggy, and it is very surreal. Mr Dalek checks his senses. Eyestalk - check. Caster wheels - check. Plunger - check. Weapon arm - MISSING! Secondary and tertiary extermination arms - missing! Switchblade hidden inside the plunger - missing! And he feels something furry - himself! Mr Dalek: "Where am I?" Unseen Voice: "On the Street." Unseen Voice: "I am the Chief Scientist." Mr Dalek: "How nice for you. Why am I here?" Unseen Voice: "We need information." Mr Dalek: "You won't get it." Unseen Voice: "By hook or by crook, we will." Mr Dalek: "Whose side are you on, apart from the 'putting people into tacky outfits' side?" Unseen Voice: "Ha ha ha ha ha - ha ha ha." At this point the voice leaves Mr Dalek alone, but our orange furry antihero suspects he is under surveillance. A bust of Jon Pertwee's head on the side of a building moves its eyebrows. And the dozen children of various nationalities in the playground supervised only by an 8 foot tall yellow furry bird seem suspiciously chipper and polite. It smells of Manhattan. Daleks hate Manhattan. Mr Dalek starts to trundle down the street in search of a crossroad, or at least some reference sign. He passes a park or two, some brownstone apartment buildings, the odd old fashioned general store - no brand names. Mr Dalek continues in a straight line, and winds up back where he started from. Was M C Esher involved somehow? Mr Dalek enters the nearest store. He asks for a map. Gordon: "Here is a map for you." The map is labeled 'The Street'. "And remember," Gordon continues, "filming starts at 11AM. You'll probably just be in background shots at first, but you should make certain you have some songs, dances, and a memory game ready in the next week or so, in case you get asked to do a meatier part." Mr Dalek exits the store, baffled. The map does indeed show The Street. There is only one road. All the businesses are things that kids would know of. And the map indicates a filming schedule. For some reason The Street does TV filming 4 days a week at 11AM, 47 weeks a year. And attendance for the filming is mandatory. Mr Dalek does not like this place. He has a sense of Deja-Vu, like he remembers it from some horrific memory. Mr Dalek sets off across a park, trying to find another road, anything. Without his power, Mr Dalek fumbles around trying to get his casters to work supporting his felt frame. Unseen Voice: "Do not let him escape. Release the Grover!" Mr Dalek awakes on the Street again. 10:58AM. The Street is now busy, full of humans and people in furry monster shapes like himself. Several of the furry ones have special chairs to wait their cues - that big yellow bird, a red whatchamacallit that likes to be tickled, a blue shapeless blob that looks very hungry. Mr Dalek is urged to the back of a gang of monsters who will be singing a big number. The show begins. As the theme tune beings, Mr Dalek knows where he is. He thanks his lucky stars that it is the original 1969 theme instead of the awful 1990s rap remix. Two awkward hours later (clearly the show must be edited before broadcast), filming concludes, and Mr Dalek finds himself left on his own. Or almost. Blue blob: "Cookie Monster is my name." Mr Dalek: "Why should I care?" Cookie Monster: "I am not allowed cookies anymore. They tell me that cookies are a sometimes food. But sometimes never comes. The only C letter food I get is cabbage. C is for cabbage - not good enough for me. C is for cabbage - not good enough for me. C is for cabbage - it's all that I can see. Cabbage, cabbage, cabbage starts with C! Well, you look a bit like a cabbage. And I'll bet you taste better than cabbage. Nom nom nom." Cookie Monster moves in on Mr Dalek. Mr Dalek's current size and girth makes evasion impossible. Fortunately, taser bolts hit Cookie Monster. After some juddering and a touch of smoke, Cookie collapses. The taser leads recede into a trashcan. Eyes pop out of the trashcan. "Are you for real?" 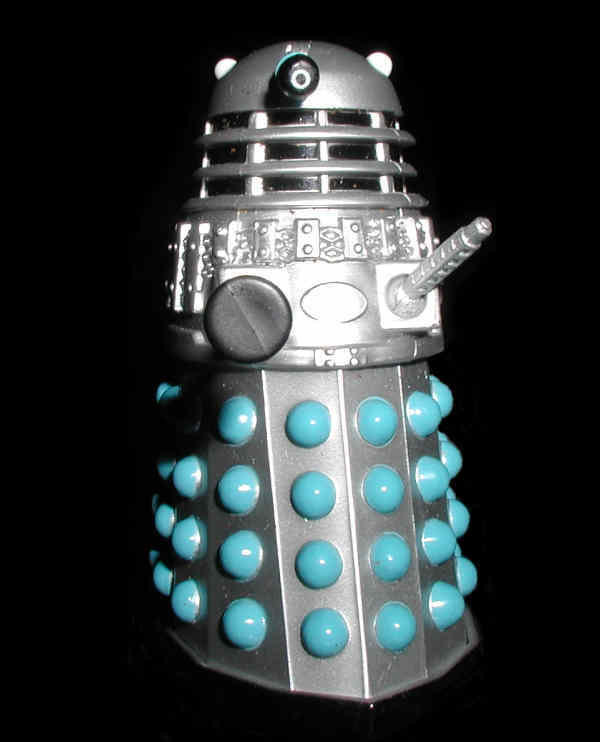 Mr Dalek: "I have been turned from metal to felt, plopped into a kiddy candy nightmare, and I have no weapons. Real enough?" A green head emerges. "If you want answers, get in here, very quickly, very quietly. And if you're very lucky, you lost your sense of smell when they converted you to felt." Mr Dalek finds the prospect of answers appealing, and gets into the trashcan. The trashcan is bigger on the inside than the outside, which gives Mr Dalek the unpleasant memory of an old enemy. The can stinks, so clearly Mr Dalek retains his sense of smell. Darn it. Green head: "My current name is Oscar. In my life as a free entity, I was a Canadian prime minister. My name is unimportant - we're talking about Canada, here. But in the early 1960s, I was deemed dangerous by the powers that be. I was imprisoned in a seaside village that looked like it belonged in Wales. Government and spy people of all shapes and nationalities were imprisoned there, slowly being driven mad, our identities erased. Eventually a man codenamed 6 outwitted the system and brought down this village. Alas, 6, myself, and Wyn were unable to escape ourselves. Oscar: "The powers that be decided to offload the village and us. In 1969 they struck a deal with a corrupt businessman. He took over the village, translated it into the image of a New York city street, started bringing in new prisoners of all shapes and sizes, and used his scientific prowess to turn most of us into monsters. He even videotaped the results and got it produced as a popular children's TV show. Adam J Purcell is the symbol of the devil." Mr Dalek: "Hang on. ADAM! Adam was born in the 1970s, (or was it the 1980s? ), years after this deal. I lived with him until I resigned yesterday. I never knew about this place." Oscar: "Well, Adam must have thought you knew something, or he wouldn't have turned you into a monster and dropped you here unawares. I can't speak for his age, but some people claim to be here from the 19th Century and the 26th Century, so let's just assume you were betrayed by a time traveler." Mr Dalek: "Was everything I knew about my life a lie?" Oscar: "Have your existential crisis later, Mr Dalek. This street requires conformity and obedience. If you stray, or if you come across as too boring, you are eliminated. Unless I find the person and bring them here to the can for safety. Here's Prairie Dawn, my agent who protects those the Street has rejected." Prairie Dawn: "I was a star on the Street in the 70s. I didn't realize the implications. I was turned felt when young and foolish. But then came "Elmo". The real US was getting more urbanized. There was no room for rural on the Street. Without Oscar, I'd have been dead long ago. Hundreds of the felt live down here, along with refugees from other TV shows. Did you know that the Dinosaur from your imagination likes to eat teenagers, because they're the right age and flavor now? Well, I have deprived him of 36 meals. Sadly, he usually outwits me. Life stinks. Sometimes I want to be caught and eliminated." Oscar: "Mr Dalek, you know the infamous Adam. Adam betrayed your trust. Now you can use your knowledge of him to betray back and free all of us from kids TV slavery." Mr Dalek: "You say this 6 character outwitted the original village. Where can I find him?" Oscar: "They renamed him 'Hooper'. He escaped the Street in the early 1980s, the only way he knew how. They did a funeral episode and everything." Mr Dalek: "Let's get a plan together. Adam will be destroyed, as will the Street." Prairie Dawn (popping her head above ground for the first time in years), Oscar, and Mr Dalek sneak around the playground. Oscar thinks he has disabled the cameras. But he does not know about the bust of Pertwee. From out of nowhere, the Grover attacks. The Grover makes a beeline for Mr Dalek. Pale Prairie Dawn, drained from years of subterranean living, jumps between Mr Dalek and the Grover. Prairie cries "I shall be felt no more!" Oscar screams. The Grover makes contact. Prairie's screams were heard all through the Street. As long as anyone on the Street lived, they would not be able to put the sound out of their heads. They would not be able to sleep more than 90 minutes at a time, either. It even caused the Grover to stop its assault, not that it mattered now. Unseen Voice: "So, Mr Dalek, I see you are with Oscar and a friend." Oscar: "His name was Wyn before you turned him into a felt woman, you monster!" Adam J Purcell, 95, but looking like he's in his early 30s, emerges. Mr Dalek: "Oscar is the ringleader of the resistance. Many many monsters are hiding in his trashcan, along with people who escaped from other kids TV shows. They want to take you down." Mr Dalek: "Who do you think developed the time travel technology to send Adam to the 1960s to purchase the Village? Who do you think developed the technology to turn humans into felt? Who do you think thought it would be hilarious to have educational children's TV shows that were produced on the back of human suffering? I am a Dalek. Evil is my speciality." Adam: "It was a beautiful sting operation. You never suspected a thing. Now we can crush the resistance and ensure the rule of our TV shows for generations to come. With the life extending techology Mr Dalek developed for me, I shall be around for all of those generations. Take Oscar off for a treatment, and round up the traitors in the can. Also, let the Dinosaur know that we found his missing TV dinners." Bert and Ernie haul away Oscar while the big Bird starts hauling people out of the trash can. Mr Dalek: "Time to turn me back into a Dalek and return to the gullible folks in Crawley. They will never know the truth about us."